Michael Palin, Shelley Duvall, Katherine Helmond and Ralph Richardson co-star in this ingenious, outrageous and totally hilarious fairy tale classic that kids, grown-ups and critics alike all call "One of the Greatest Fantasy Movies Ever Made!" My friend Kevin's father Onions (his real name is "John" but we refer to him as "Onions" for obscure reasons that will remain that way) actually originated this tale. One day during dinner, Onions informed the gathered flock that while in times past he did not enjoy the flavor of the condiment called "mustard," in the present day he most clearly does delight in a little savory sauciness. Onions said, and I quote, "I didn't used to like mustard, but now I do." It still brings a little tear to my eye. When I saw the film theatrically in the fall of 1981, I really liked it, and I continued to enjoy Bandits on video after that. However, it never became one of my all-time favorites, so I went long stretches during which I didn�t watch the movie. When I gave it a modern reappraisal, I decided that it offers a fun and fairly entertaining but rather spotty film. Certainly it possesses a clever and wide-open plot, as it tells the tale of a group of would-be thieves who use doorways into different time zones to plunder the riches of the past. Actually, that brief synopsis tells you both less and more of the situation. "More" in that it implies that Time Bandits actually has a plot. It doesn't, really. The time-travelling setup exists mainly as an excuse to get our principals to interact wackily with famous denizens of other lands and eras. Oh, it attempts something of an arc in that our heroes are occasionally threatened by The Supreme Being (Sir Ralph Richardson) and need to elude him. In addition, a being who embodies evil - called the Evil Genius, actually (David Warner) � tries to capture them, but the story elements seem somewhat half-hearted. When I say that my synopsis doesn't really offer a full picture of the story, however, I mean that it doesn't inform you of the richness of the movie's background. You see, the heroes to whom I refer are not just everyday, ordinary time-travelers. No, they're a group of six dwarfs; the seventh, Horseflesh, died before the start of the events in the movie. They�ve worked since the beginning of time as assistants to The Supreme Being, and they took charge of trees and shrubs. However, they received criticism for some poor work so they steal a map that shows "holes" in the universe, which exist because creation was something of a botched job. As I mentioned earlier, clearly this premise offers a wealth of opportunities, both comic and adventure. Early in the film, humor strongly dominates as our group robs Napoleon (Ian Holm) and then encounters Robin Hood (John Cleese). Admittedly, the structure of the film to this point resembles glorified sketches, not surprising considering the Monty Python pedigree behind it. Also not surprisingly, this portion of the film - up through the first 45 minutes or so � consistently entertains and delights. The section in Sherwood Forest provides probably the movie�s strongest sequence. This is where the movie starts to falter. This segment seems to serve little purpose in the film. Ultimately, the bandits find Kevin and take him with them, against his strong wishes to the contrary. Now removed from his dream existence, Kevin clearly resents and dislikes his old comrades, but that factor plays virtually no role in the plot; Kevin sulks for a scene and then the action resumes as if nothing ever happened. Oh well, at least the first 45 minutes entertain well enough to largely make up for the rest. There's some terrific material and wonderful performances in there. Holm and Cleese do some hilarious bits, and the film portrays a fantastically skewed view of history. I won't even bother to relate some of the comic gags, because they won't translate at all to the printed page, but suffice it to say that there's some great work going on during the early parts of Time Bandits. I can�t say that Time Bandits lives up to my childhood memories of it, and the movie certainly seems rather erratic. However, it includes a lot of great material. Despite the slow points and the bad scenes, enough of the film works well that I think it�s good overall. Time Bandits appears in an aspect ratio of approximately 1.85:1 on this Blu-ray Disc. While it came with some strong points, too many problems accompanied the presentation as well. The main concern related to source flaws, as the movie suffered from a rather dirty print. Throughout the flick, I noticed quite a few examples of specks, blotches, nicks, tears, vertical lines and scratches. Some scenes got off without many distractions, while others could be pretty messy. Though the movie wasn�t terribly filthy, it was certainly less clean than I expected. For the most part, sharpness looked fine, though not great. Most of the film demonstrated fairly positive delineation, though fine detail was unexceptional. Some of that stemmed from the edge haloes the cropped up through the movie; those could make it a little softer than I�d like. No issues with jagged edges or moir� effects occurred, though I did think the flick could seem a bit blocky at times. Colors tended to work well. Skin tones occasionally appeared a smidgen ruddy, but the hues were usually full and rich. Blacks appeared deep and dense, and low-light shots created images with nice clarity. In truth, the source defects became the biggest problem here; they were prominent enough to downgrade the image to a �C�. Expect additional concerns from the somewhat mushy DTS-HD MA 5.1 soundtrack. The soundscape tended to be ill-defined. At times, it sounded like mono source material repurposed for multichannel. That wasn�t the case, but the results came across that way. The good stereo imaging of earlier mixes showed muddy delineation here, and dialogue also didn�t seem well-centered; the lines tended to bleed to the sides much of the time. Effects occasionally boasted accurate localization, but they also could appear to come from some sonic neverland that didn�t line up terribly well with the onscreen action. The surrounds had a lot to do � probably too much, given the sound design of the original movie. The back speakers added hazy delineation to the track and could be something of a distraction; the information they offered didn�t blend especially well, so the surrounds became a too active partner. Audio quality was generally good but could be erratic. Speech demonstrated some edginess, but most dialogue was reasonably distinct, and the voice of the Supreme Being demonstrated decent bass response. Music was lackluster and failed to display much life, though that side of things varied. Some parts of the score offered good vivacity, while others tended to be flat. Effects also seemed up and down. At times, they seemed thin and a bit harsh, and louder elements like explosions featured some distortion. Still, dynamics appeared decent most of the time, and some of the problems stemmed from the age of the material. This wasn�t an awful mix, but I didn�t care for it; like the picture, it earned a disappointing �C-�. How did the picture and audio compare to those of the 2004 SE DVD? On both accounts, I preferred the DVD. Its audio didn�t blow away the Blu-ray�s, but the earlier disc�s 5.1 mix was clearer and better delineated. Though the Blu-ray offered a bit more visual detail, it wasn�t tremendously crisper than the DVD. The latter didn�t suffer from the surfeit of print flaws seen on the Blu-ray, which was the major difference � and the main reason the DVD remains superior. 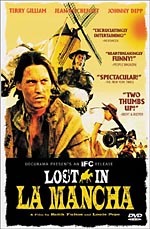 I don�t know where Anchor Bay got this awful print from, but if they were too cheap to strike a new transfer, they would�ve been better off just recycling the one generated for the 2004 DVD; it couldn�t look worse than this image. While the earlier DVD set included a few good extras, the Blu-ray skimps. 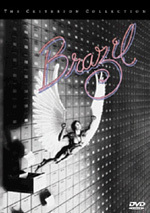 In addition to the film�s trailer, we get an Interview with Terry Gilliam. During this 18-minute, 12-second piece, the director discusses the origins and development of the film, script/story topics, cast and performances, visual effects, influences, and some general thoughts about the flick and his career. Gilliam is always an interesting interview subject, so he offers a mix of nice notes here. 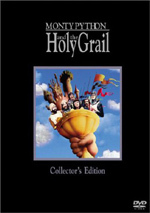 The clip�s too short to be terribly substantial � a full-length commentary would be preferred � but Gilliam makes the most of his time on screen. 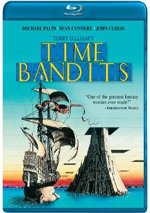 In the end, although I clearly find fault with the film, I enjoy Time Bandits enough that the movie comes recommended. It sags at around the mid-point, but it still packs enough lively and amusing material to merit a look. The Blu-ray presents problematic picture and audio and only one decent supplement. I enjoy the film, but this Blu-ray is a weak release. Fans should stick with the 2004 DVD and not bother with this shoddy package.